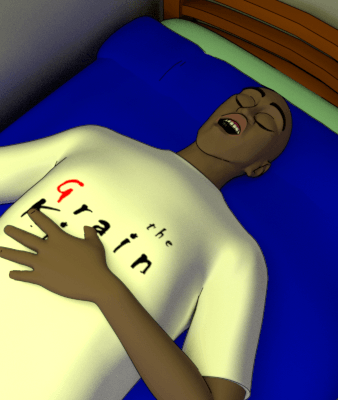 Eddie awoke curled on the filthy wooden floor of Tim's room, the light of dawn and the sound of hammering coming through the room's only window. Eddie climbed unsteadily to his feet. Bryce remained on the bunk, snoring softly. Eddie shook his shoulder. "Bryce. You still with us?" Bryce didn't respond. His breath remained steady. Eddie grunted, pulled on his shoes and moved to the door. 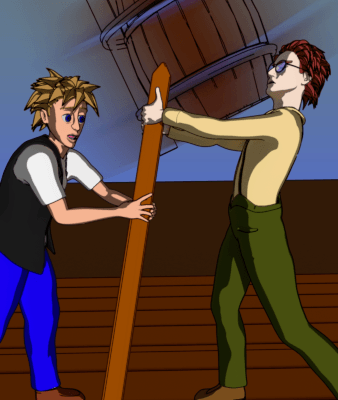 Outside, he found Tim in a small lot behind the blacksmith shop, hammering at the support brace of a huge contraption. 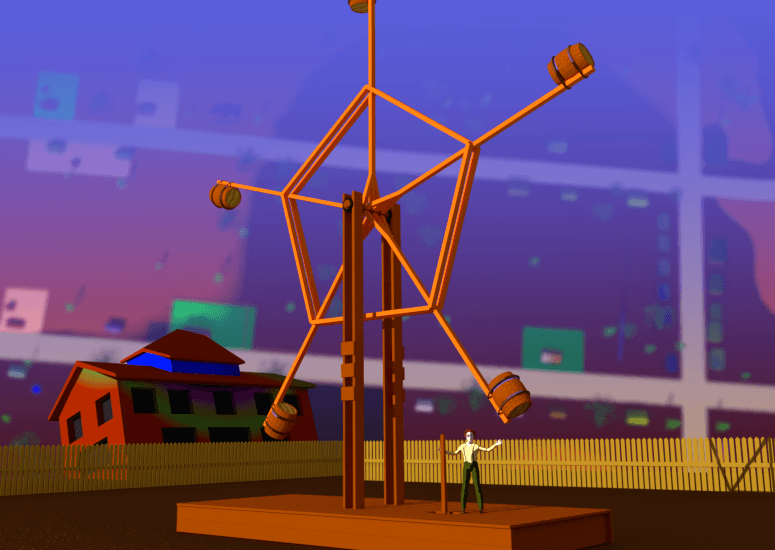 It looked like a small ferris wheel, its hub about fifteen feet off the ground with five beams extending out from its center. A large barrel was tied to the end of each beam, the bottom beam almost reaching the platform below it. Looking up at the top beam, Eddie's stomach did a lurch. He'd forgotten about the strange landscape upon which he stood. The blacksmith's shop was on the side of the Holcomb hammer-shape, so as Eddie's eyes moved up, he found himself looking down on the shops and houses of the landscape below. His knees buckled, and he nearly fell over. "Morning," Tim said with a nod. "You get used to the view after a couple days. That first day, everyone was constantly falling over. The dogs wouldn't stop barking. It was crazy." Eddie closed his eyes and gave himself a moment to adjust. He opened his eyes, keeping them down. "What are you making?" Tim finished hammering a nail into the side brace. He stood. "You, my friend, are about to witness the world's first genuine perpetual motion machine." "It's a gravity wheel. Something that could never have worked until gravity did a backflip here in town. I will start this wheel spinning, and it will never stop." Eddie looked up at the wheel. Two ropes looped around the hub, connected below to a lever embedded in the base of the contraption. He turned back to Tim. "And that's a good thing?" Tim threw up his hands. "The applications are limitless. A wheel like this could power a mill, pump water... it could generate electrical energy. The only problem is, it can only work right here." "How does it work?" Eddie asked. Tim grinned. He ran towards the blacksmith shop and pointed up at the smokestack. "The idea hit me when I saw that." The smokestack was a brick tower that extended well above the building. At the top, several of the bricks had fallen away. "Gravity is different up there," Tim explained. "You get that high, and you're no longer in the gravity field of this big hammer in the sky. Up there, gravity is the same as everywhere else, pointing down at the landscape. And if gravity pulls perpendicular up there to the gravity here on our ground, then I can create a wheel that will be drawn by two different gravitational vectors." Tim grabbed a paper off a workbench and thrust it into Eddie's hands. "Here. This is pretty much the theory summed up." 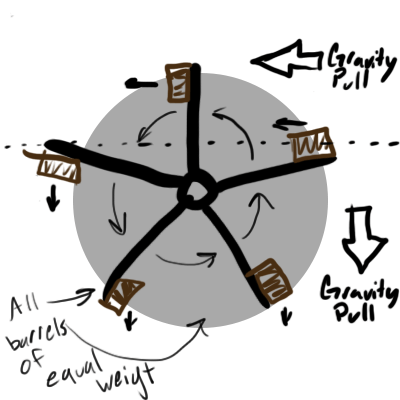 Eddie studied the diagram as Tim tugged and tinkered with the gravity wheel. "I suppose," he said. "We're about to find out if I'm right," Tim said. "I think it's stable now. It's time to put it to the test." He stood at the lever, giving the whole contraption one last look. "This is it," he said. "Three, two, one..." He pulled the lever. The ropes on the hub slackened. Tim shook his head. "No, this isn't too surprising. I need to..." He moved to the barrel at the end of the bottom spoke and pushed at it. It eased into motion, the wheel turning, the highest barrels arcing over the top. Tim pushed until the bottom barrel arced up out of reach. He stopped and watched. The wheel continued, not slowing when he stepped back. Tim grinned. "There, you see? It's moving on its own now. If I'm right, it won't stop until I stop it." "That's cool. Now, can we discuss..."
"The girl. We need to save the girl, I haven't forgotten. I wanted to give this a trial run before I focused on the impossible question of how to fight both a powerful wizard and a huge dragon." "None. I think your best bet is to take the girl and run away. It's a good Plan A, but I doubt you'd get away with it." "Wouldn't the dragon rider bring more dragon riders and destroy this town?" "Perhaps. Then again, the dragon man might have been making an empty threat. Anyway, we could always say you stole her from us, and he'd come after you and leave us alone." "Yeah. Then everyone wins." Eddie's attention shifted back up to the wheel. "Uh, Tim..."
Tim frowned and turned. The wheel was not only spinning. It was accelerating. The hub squeaked with increased volume as the barrels swung by faster and faster. Eddie tracked a single barrel as it arced from the bottom to thirty feet high in less than two seconds. "I hadn't anticipated this," Tim said. "Only if I can't stop it." Tim moved back to the lever and pulled. The ropes tightened on the hub, but they had almost no effect. "This might be a problem." "Will it speed up forever?" Tim grunted, his whole body leaning into the lever. "It might reach a relative terminal velocity, but the stress will probably tear this structure apart before that happens. This thing will send barrels off in all directions like splintery missiles." Eddie jumped up onto the platform and pushed on the lever as Tim pulled from the other side. The rope bit hard into the hub. Smoke rose from the contact. "Come on," Eddie grunted. The barrels slowed. The structure shuddered. With their combined weight on the lever, Tim and Eddie ground the whole wheel's inertia back down to zero. Eddie relaxed and stepped back. Above, the blackened ropes continued to smolder. "Well, that went rather well," Tim said. "We almost sent barrel rockets scattering all over town." "Yes, but we proved that we can harness energy from this aberration. It appears to take no energy to maintain the distorted gravitational field of this town, and yet, we can generate energy from the resulting distortion. We've created something from nothing. Physically impossible, but there it is." "And I'm happy for you," Eddie said, wiping sweat from his face. "I need to go." Tim jumped off the platform after Eddie. "Where?" "To the jail. I need to see if they'll let me take that little girl."